Weiss Utility Gauges Are Used For General Service Conditions On Air, Water, Gas And More. 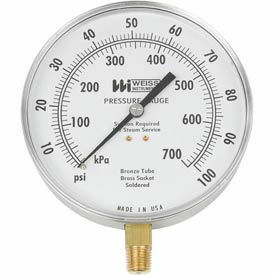 Weiss Utility Gauges are designed for general service conditions (for pressure or vacuum) on air, water, gas, or any other medium that doesn¿t attack brass. Sizes range from 2 inches to 4-1/2 inches. Models are made with an acrylic window and are available with PSI ranging from 0-15 PSI to 0-300 PSI. Models with 0-30 inch VAC are also available. All dial bottom sizes are 1/4 inch NPT (threaded). All Weiss TL Gauges conform to ANSIB40.1 accuracy Grade B-2% mid scale. Weiss HVAC Contractor Gauges Meet The Standard Specifications For Heating, Cooling, And Air Conditioning Applications. Weiss HVAC Contractor Gauges are made with 1/4" NPT (Threaded) Dial Bottoms and 4-1/2" dials. Models range up to 300 PSI. Models with 30 inch VAC/30 PSI are also available. All gauges conform to ANSI B40.1 accuracy Grade 1A full scale. Wika® Glycerine Filled Commercial Gauges Are Used For OEM And General Industrial Applications. Glycerine fill liquid dampens the Bourdon tube and reduces wear of the movement to extend gauge life. Designed for air compressors, hydraulic presses, pumps, marine engines and other hydraulic or pneumatic equipment. Wetted parts are made with a brass copper alloy. ABS plastic case provides impact resistance. Plastic window is ultrasonically welded to gauge. Ambient operating temperature range is -4 to 140°F. Gauge sizes available are 1-1/2 or 2-1/2 . Compatible with US gauges 580L and 580LU, and Ashcroft 3005P. Wika® Black ABS Commercial Gauges Provide Reliable Service For Use With Pumps, Compressors And More. Designed for long and dependable service under rugged conditions. Gauges feature lower mount connection. Wetted parts are made from a brass copper alloy. Black ABS case provides impact resistance. Removable snap-off acrylic window. Ambient operating temperature range is -40 to 140°F. Available gauge sizes are 1-1/2 , 2 , 2-1/2 and 4 . Choose from 1/4 or 1/8 NPT. Gauges are for use in applications where measured media does not corrode brass. Meets ASME Grade B standards. 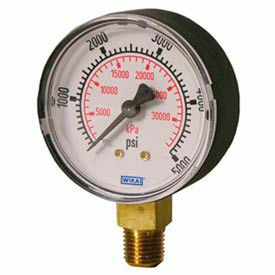 Wika® Polished Brass Commercial Gauges Are Used For Use With Compressors, Hydraulic And Pneumatic Systems, And More. 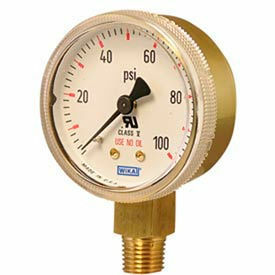 Brass commercial gauges feature lower mount connection. Wetted parts are made from a brass copper alloy. Polished brass case provides impact resistance. Removable snap-off acrylic window. Ambient operating temperature range is -40 to 140°F. 2-1/2 gauge size. 1/4 NPT. Compatible with US Gauges 1370, P-500 and P-505. 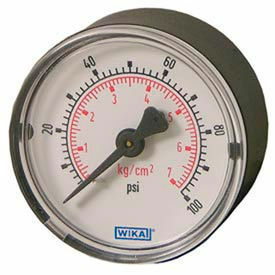 Wika® Steel Commercial Gauges Are Used For Use With Pumps, Valve Positioners, Compressors Or As A Contractors Gauge. 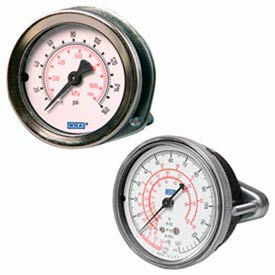 Steel commercial gauges feature lower mount connection. Wetted parts are made from a brass copper alloy. Black steel case provides long-lasting durability. Removable snap-off acrylic window. White aluminum dial. Ambient operating temperature range is -40 to 140°F. Available gauge sizes are 1-1/2 , 2 and 2-1/2 . Compatible with US Gauges 1370, P-500 and P-505. 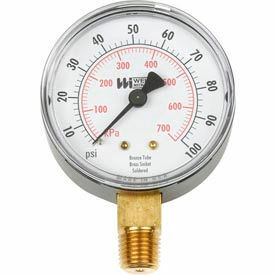 Gauges are for use in applications where measured media does not corrode brass. Wika® UL Listed Compressed Gas Gauges Are Used For Use In The Welding Industry. 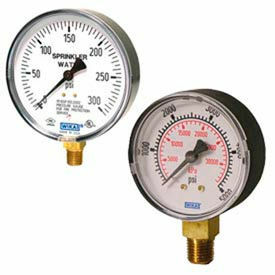 Compressed gas gauges feature a Bourdon tube with low copper content for pressure ranges 800 psi and below, making it safe for use with acetylene. Lower mount connection. Wetted parts are made from a brass copper alloy. Polished brass case provides long-lasting durability. Removable twist-off polycarbonate window. White aluminum dial. Ambient operating temperature range is -40 to 140°F. Available gauge sizes are 1-1/2¿, 2¿ and 2-1/2¿. Connections are 1/8¿ NPT or 1/4¿ NPT. Compatible with US Gauge P-590K and P-600, and Ashcroft 1495A. Cleaned to ASME B40.100 Level IV. UL approved. Wika® Black ABS Center Back Mount Commercial Gauges Are Used For Regulators, Medical, Compressors, Pumps And Other Tough Applications. Commercial gauges feature an industry-recognized ASME 3/2/3% of span accuracy. Center back mount connection. Wetted parts are made from a brass copper alloy. ABS plastic case provides impact resistance. Removable snap-off polycarbonate window. Ambient operating temperature range is -40 to 140°F. Available gauge sizes are 1-1/2 , 2 and 2-1/2 . Connections are 1/8 NPT or 1/4 NPT. Compatible with US gauges 1370, P-500 and P-562K. Wika® Steel Center Back Mount Commercial Gauges Are Used For Medical Usage, Pneumatic Controllers, Valve Positioners, Food And Beverage Industry, And Other Tough Applications. Commercial gauges feature an industry-recognized ASME 3/2/3% of span accuracy. Center back mount connection. Wetted parts are made from a brass copper alloy. Black steel case provides long-lasting durability. Removable snap-off polycarbonate window. White aluminum dial. Ambient operating temperature range is -40 to 140°F. 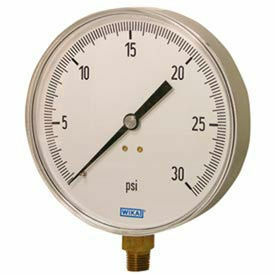 Available gauge sizes range from 1-1/2 up to 4 . Connections are 1/8 NPT or 1/4 NPT. Compatible with US gauges 1370, P-500, P-505 and P-562K. Wika® U-Clamp Commercial Gauges Are Used For U-Clamp Panel Mounting. Gauges are designed to fit into U.S. size panel cut-outs. Low-friction Swiss movement insures a long and reliable service life. Center back mount U-clamp connection is made of zinc-plated steel. Wetted parts are made from a brass copper alloy. Black ABS plastic case with white ABS dial provides long-lasting durability. Removable snap-off acrylic window. Ambient operating temperature range is -40 to 140°F. Gauge sizes range from 1-1/2 up to 2-1/2 . Connections are 1/8 NPT or 1/4 NPT. 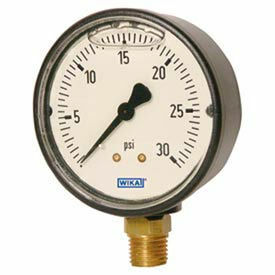 Wika® 4.5" Stainless Steel Contractor's Gauges Are Specifically Designed For The HVAC Market As A Contractor's Gauge. Wika® 4.5" Stainless Steel Contractor's Gauges are used for use in static applications. Wetted parts are made from a brass copper alloy. Stainless steel case and white aluminum dial provide durability and strength. Has a lower mount 1/4" NPT connection and a removable snap-off acrylic window. Ambient operating temperature range is -40 to 140°F. Available in various ranges.